You can be rest assured that your cat will receive first class care and attention, leaving you free to relax without worry. We have 16 luxury suites, each with its own comfy, brightly coloured bed and soft covers, scratch post and lots of toys. Our suites have heat pads for winter stays (during November to April) with lighting, normal doors and has been especially catered with as many glass windows on one side to allow a beautiful garden view for your cats to enjoy. To give your pet something different to look at, all of our rooms are themed with various cartoon animals that your cats will enjoy, adding a bit of colour to their stay. Three times a day, your cat will have their own interaction with the staff, who will sit in the rooms with them, giving them the love and affection you normally would. There are enclosed conservatory runs with music playing all day long, and 24 hour on site staff to meet all your cats needs. 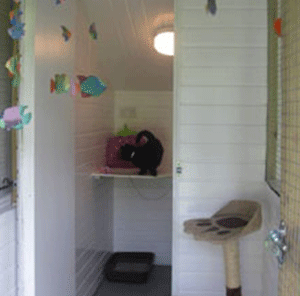 Me-als Cattery also offers use of the playroom on request, where they will have extra play and socialise with members of our staff. Cats will be fed in the mornings and each evening. We supply Whiskers and Felix wet jelly pouches and also two different flavours of Go-Cat dry kibble. Specialist diets are accepted but food must be supplied by the owner.